International Capitalism and African Conflict – Royal Times of Nigeria. According to Article 2 of the 1948 United Nations Convention on the Prevention and Punishment of the Crime of Genocide, mass killing is a condemnable act. The article defines genocide as killing or causing serious harm with intent to destroy in whole or in part a national, ethnic, religious group. What a noble sentiment. For decades, the international community has relished its reputation for standing against genocide and all other crimes against humanity. The issue is that the international community only intervenes in matters that are strategically or financially beneficial to it. Otherwise, they would let innocent people die by the dozens. This is the case in southern Cameroon, a region which is currently engulfed in conflict. The region, unofficially known as Ambazonia, contains a small Anglophone minority in comparison to the Francophone majority in that country. The region has been agitating for separation and independence from the rest of the country, and as a result has been met with violent repression and discrimination. 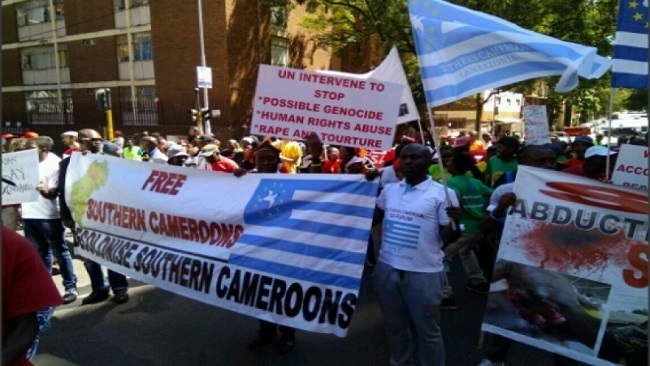 In the past few months, dozens of Cameroonians have been killed, allegedly by the Cameroonian military under orders from President Paul Biya. Biya has been in power for over 30 years, and has declared that he intends to run for a seventh term in office. Biya has also been accused by the separatist movement of being resistant to peaceful dialogue. However, none of this seems to stop foreign governments from profiting from this violent and undemocratic regime. In June, the UK announced that it had signed a £1.5billion trade deal with Cameroon. This funding will go straight to the government that continues to persecute and massacre its own people. But of course, the international community sees nothing wrong with this, even though the United Nations has declared a humanitarian crisis in the region. This is how foreign nations enable and endorse conflict on the continent. If they are able to benefit financially from mass violence, they let it proceed even though they claim not to tolerate crimes against humanity. It is time to end the hypocrisy. May God bless our beloved country Nigeria.